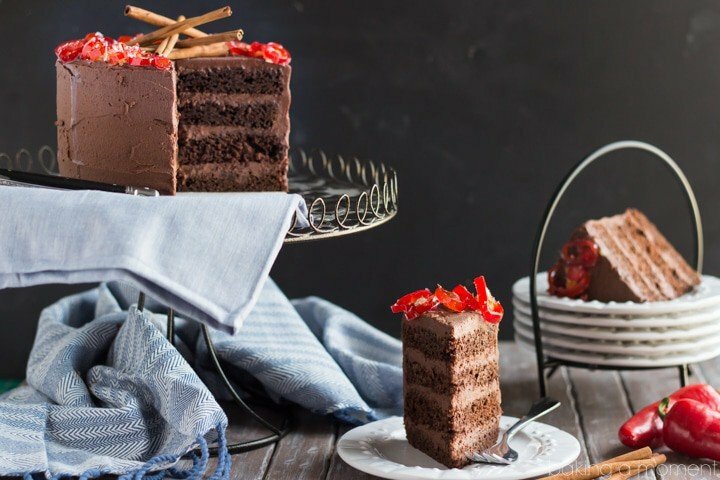 Four layers of moist, rich, and decadent Chocolate Cake, filled and frosted with a fluffy Mexican Spiced Chocolate Whipped Ganache frosting, and garnished with sweet/hot Candied Serrano Peppers. It will warm you from the inside out! And I really do think it’s a great way to start out the week. Which, around these parts, is bone-chillingly cold, damp, and dreary. My soul is just crying out for something comforting, that warms from the inside out! Woo-hoo! Mexican chocolate to the rescue! It’s spiked with cinnamon and nutmeg and Kahlua and cayenne… to make you feel all warm and tingly. And if you are a fan of the spicy + sweet combo, then you’re gonna luuuuurve the candied Serrano pepper garnish. They’re sweet and hot, and a little stick-to-your teeth chewy. Kind of like Red Hot’s but a little more grown-up. The best part is, you’ll end up with the most addictive hot pepper syrup left over. You can drizzle your cake with it, if you like a little extra spice, or you can use it in a cocktail! I can’t wait to blend some of it into my mango-berry margarita! Preheat the oven to 325 degrees F, mist (2) 6-inch cake pans with nonstick spray, and line with circles of parchment. Place the first 7 (dry) ingredients in a large mixing bowl and stir to combine. Mix in the butter on low speed, until the mixture resembles damp sand. Stir in the eggs, greek yogurt and vanilla, scraping the bottom and sides of the bowl to be sure all the ingredients are well-combined. Divide the batter equally between the two prepared pans and bake for 25-30 minutes, or until a cake tester inserted in the center comes out clean or with one or two moist crumbs. Cool the cakes completely, and cut each into two horizontal layers. 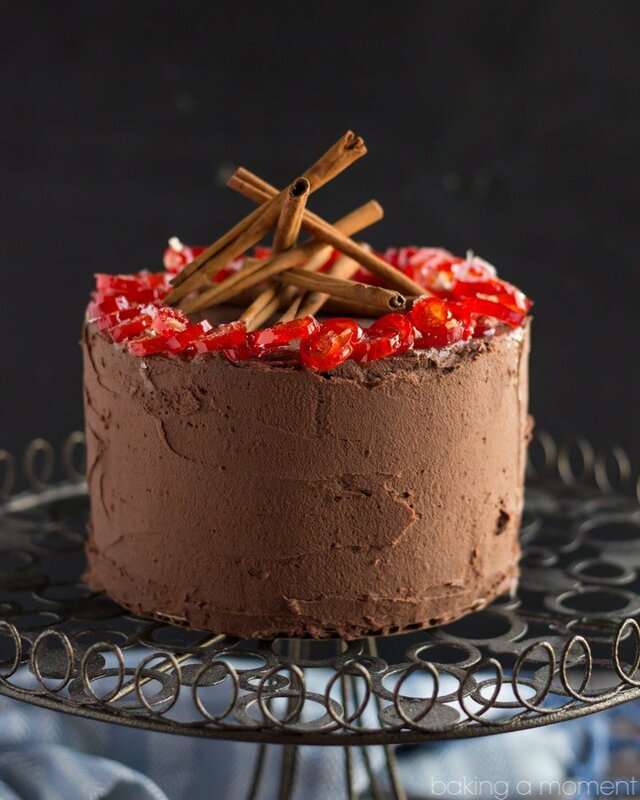 Fill and frost with Mexican Chocolate Frosting, and garnish with Candied Serrano Peppers and cinnamon sticks. Place the chocolate chips, liqueur, cinnamon, vanilla, nutmeg, and cayenne in a large mixing bowl. Heat the cream (in a small pot on the stove, or in a heat-proof vessel in the microwave) until small bubbles form around the edge and wisps of steam rise from the top. Pour the cream over the chocolate and spices, and allow it to sit for a few minutes. Stir the cream together with the other ingredients until smooth. Allow the mixture to cool and firm up to the consistency of pudding (about 2 hours). Whip on high speed until paler in color and fluffy. Place the water, sugar, and sliced peppers in a small pot and bring to a boil over high heat. Turn the heat down to medium-low and simmer for 10 minutes. Cool completely. Drain the candied peppers and reserve the syrup for another use. I recommend chilling the cake layers in the fridge or freezer before frosting. These helps them to be less crumbly during the frosting process. Hope you had a relaxing weekend and your week is off to a great start. Stay warm, my loves! « Previous PostGrapefruit Bowknots and a Giveaway! I love chilli chocolate Allie so this is just perfect for me! It looks and sounds divine. Absolutely beautiful layer cake and styling, Allie! Hands down, there is nothing like a chocolate (with dark cacao and whipped GANACHE; yeeeeeeee!!!) layer cake to celebrate the new year, but also to warm the soul. What a pleasure! Love those candied serrano peppers, too; they are so beautiful against the chocolate background! Well done, my dear!! And a happy new year to you! (scrambling, eh, I hear you. I had a kitchen flop yesterday… and well, I do have a back up, but…. I need to remind myself ‘I have all the time in the world.’ My new montra.) hehe. This is the perfect way to start out the week! Beautiful cake! Hi Allie! This cake looks absolutely incredible! I’m so glad that you were able to look on the bright side of things, hard to do with a recipe failure, I know! : ) I’ve never had a mexican chocolate frosting before, so I’m very intrigued! I love the looks of it! And those Serrano peppers look like the perfect touch! Delish! Hi Gayle! Mexican hot chocolate is one of my very favorite flavors, especially at this time of year. I’m so glad you liked the idea; thanks so much for the sweet comment! Whipped Ganache!! Yes, please! This cake looks beautiful and so delicious, Allie!! I absolutely adore this! Mexican Chocolate is totally my thing. Pinning! p.s. I’m completely in love with your candied peppers! Well I for one am happy that you put this up. It certainly warmed my soul even though I am detoxing. It gave me something to look forward to. Gorgeous. 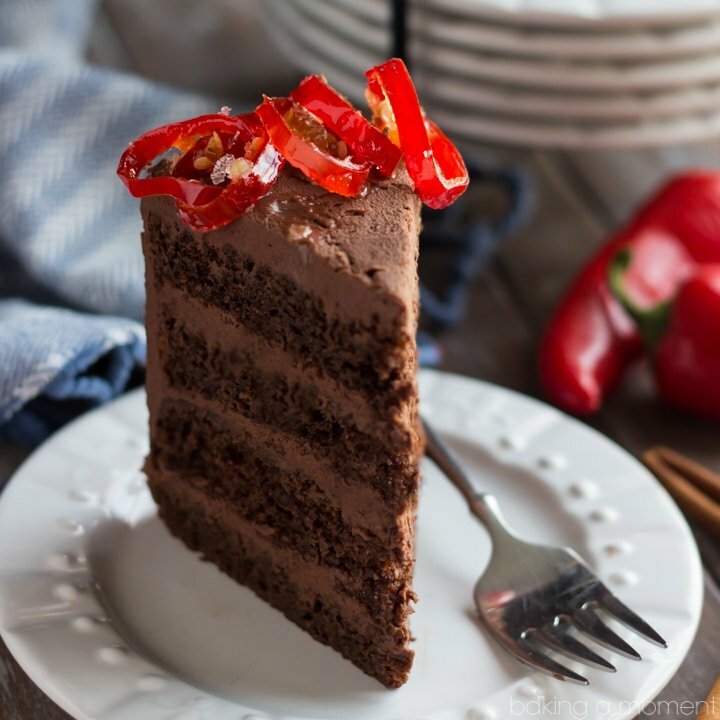 I love all the flavors that you added to this cake, and I especially love that you made your own candied peppers! They add such a unique and beautiful touch to an already wonderful dish! Thank you so much Renee! It was a last minute idea but I really liked the way they punched up the “pretty” factor. Thanks for reading! You never fail to get me hungry too early in the morning. Mexican chocolate ANYTHING is the best, so this….. next-level. CANDIED. SERRANO. PEPPERS?!?! Why we aren’t best friends I will never understand. I love chocolate and spicy, so this looks awesome to me! What a delicious idea for an even better chocolate dessert…thanks for sharing! Oh my heavens, Allie. This cake is EVERYTHING! That frosting/whipping ganache will be eaten with a spoon. Trust me, it’s going to happen! Allie, I hear you sister. . it’s freaking bone-chillingly cold over here.. I could use a big slice of this Mexican chocolate cake right now!!! 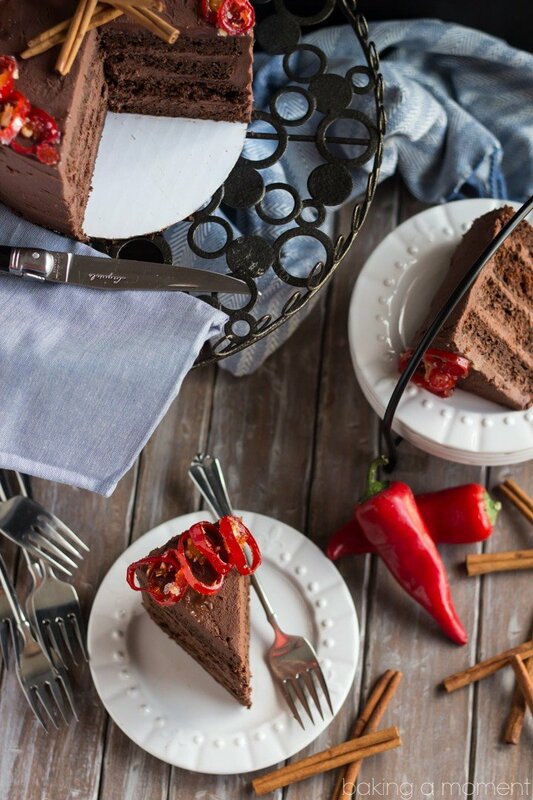 love the heat in mexican chocolate cake and love what you did with the frosting and the Candied Serrano Peppers!! As a Mexican-American, I grew up eating these flavors and drinking the hot chocolate. I am going to make this my next baking project. Thank you! Yay! I’m so glad to know you feel it measures up to your memories! Thank you so much for the great feedback, Cialci! Beautiful cake, Allie. 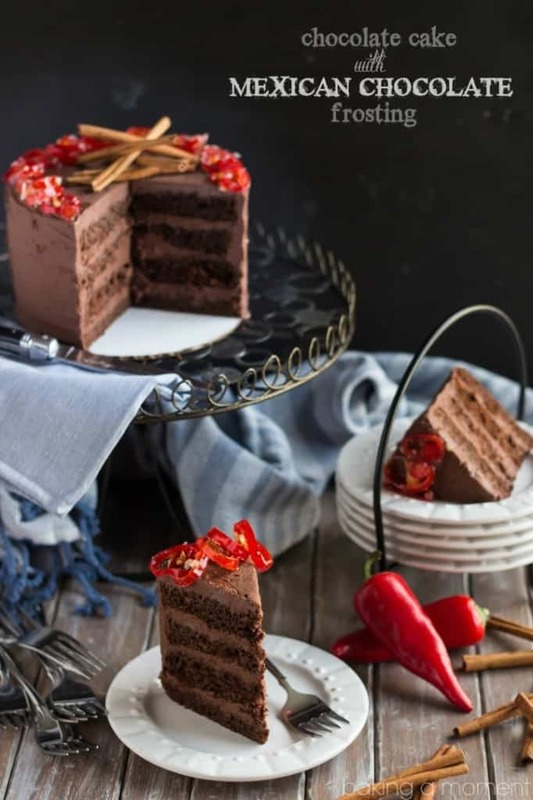 The candied peppers, OMG, they make this cake even more perfect! Thanks Julie! I know they’re a little weird/different but my hubby and I really liked them! Well done, Allie! This is a gorgeous way to start the new year. I mean look at those layers and how moist they are. I totally drool over this cake now. Yummmm! I had to pop over to read the recipe as soon as I saw this. Mexican Frosting? This is AWESOME! I love it, it’s so unique!! Thank you so much Nagi! At first I was just going to do regular chocolate on chocolate but then my wheels got to turning… 😉 So happy you like it! There’s nothing a good slice of chocolate cake can’t fix! This looks SO delicious and I am totally in love with that mexican choc frosting! Gah I couldn’t agree more! Chocolate cake solves all of life’s problems. Thanks so much for the great feedback Thalia! Thank you so much Jennifer! I got lucky with some really nice light that day. So glad you enjoyed; thanks for the sweet comment! Happy New Year, Allie! It’s super cold here too and this gorgeous cake is just what I need to warm me up! Love the heat from the Mexican chocolate frosting and the candied Serrano chili peppers sound absolutely amazing! Thanks Kelly! Brr I just got home from grocery shopping and ouch! I think I need a slice right now lol! This look amazing Allie! Your talents astound me. You’ve made me want to eat something spicy with my chocolate. Lovely. My goodness! I knew that I shouldn’t have clicked on this recipe today. Now I will be craving a big piece of this cake all day. Beautiful! Of course I saw this when it is not an acceptable time of day to eat cake! This looks diving. Thanks for sharing! There’s a time of day when it’s not acceptable to eat cake?! Lol… So glad you enjoyed Jolena; thanks for commenting! Oh my, I love the sound of this cake! That frosting! Those candied peppers! Love love! This cake is absolutely AMAZING! The candied peppers are gorgeous!!! This looks amazing. I’m such a wimp with chillis though. On the other hand, the giant man-baby would dive in head first! I can’t handle much heat either Lisa- that’s why I only spiced the frosting 😛 My hubby loved it though- he gobbled up all those candied peppers. Must be a guy thing! Wow, girl! it looks like we’ve both got sweets and heat on the brain! This looks phenomenal and THAT frosting, I’ll just take a bowl of that, thanks! Whipped ganache?! I’m so sold. This looks stunning by the way. Looks incredible! I love spicy chocolate! And holy moly is it cold out this week. Warming up with cake seems like the perfect solution! Candied serrano peppers? On a CAKE?? I love love this miss A! What a stunning way to start the new year! Mexican Spiced Chocolate Whipped Ganache frosting? YES, PLEASE. Amazing food styling and photography! Pinned! How did you know that Mexican chocolate is my FAVORITE winter flavor? I love this cake so much!! I do too- and that is exactly what I was hoping the peppers would do. Thank you so much Whisk and Shout! What a beautiful looking cake Allie! I’m very curious to try it! Pinned! Candied peppers?? Brilliant. I’m totally going to make those sometime. Spicy chocolate heaven here I come. Hooray! I’m so happy you like the idea, June! Enjoy! I’m in LOVE Allie! What a tremendous cake! Such a show-stopper 🙂 Pinned! Wow thank you so much Trish! This is my kind of dessert. I love it, Allie! Will be pinning. So I remember seeing this on Facebook and thinking… she gets me. She really gets me. This cake… it’s absolutely stunning. Love your food styling too… really impressive! Totally magazine worthy! 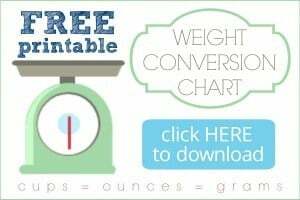 Pinning the heck out of this! Ah you’re too nice! Thank you so much Chris! Hey Sima! Thanks so much for reading and trying my recipes! I often make recipes ahead, and then just assemble the components just before serving. In this case, I think you could probably make the cake layers a few days ahead and just keep them tightly wrapped in the fridge. Same goes for the frosting, although with that you’ll want to set it out at room temp a few hours before using it, so that it can soften. Maybe even fluff it up a little with your mixer. And, for the peppers, I think as long as you keep them submerged in the syrup they should be ok. Once they’re drained they tend to get a little crunchy, which is still not too bad though! I hope that helps! You are such a nice wife to make this for your husband’s birthday. I hope you both enjoy! Allie, the cake was a hit and everyone loved it. I made homemade Khalua since I didn’t have any and the liquor store was closed already. If you google Serrano peppers and click images you will see what a Serrano pepper looks like. All peppers are green and turn red if they are not harvested in time. I left my green peppers in the sun for a few days and they turned red. I will make this cake again. Hooray! I’m so glad that everyone loved the cake Pat! Hi! I finally made this cake for my son’s second birthday! Everyone loved the flavors of the frosting! So tasty. The cake part didn’t turn out as moist but rather dry. Any suggestion or thoughts why? Love your blog and hope to try more recipes soon!! Hey Sima! Thanks so much for reading and for trying one of my recipes! I’m so sorry it came out dry. I have no idea why it would- I make this quite often and it’s always extremely moist. Could it have been slightly overbaked? Or could something have been measured incorrectly? I think this is my favorite icing ever! Put it on top of a homemade devils food cupcake for a sinful/guilty pleasure wine party… OMG! Whipped ganache is my new favorite thing. Thank you so much for this delicious recipe! Made this cake as a 9″ six layer cake. It was marvelous. A real hit. Goes into the collection for future use. I just made this cake. Omg!!!! Absolutely fantastic! Yay! So happy you liked it Jamie!